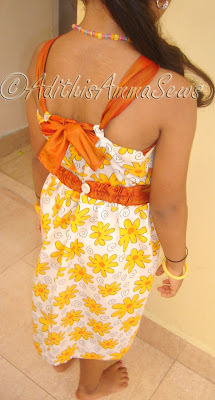 I have decided to call this Adjustable Summer Dress as it is very accomodative and is quite adaptable as a child grows! Remember Back to School Dress (Dress No.1 of this style) , after having made that, i fell in love with the pattern i drafted, wanted to make it again and some cheery yellow flower fabric was just the right one to do so. Features are the same as that of Back to School Dress, except that i have added a horizontal slit at CF to let the straps pass through instead of the vertical slit i had made in Dress no.1. Horizontal slit is even more invisible and camouflages well once the straps are inserted! When i told her she got reviews on my blog for Back to School Dress on being a great model, she surprised me with this pose!!! Your dress is super cute! I love the pattern - and the yellow fabric is darling! what a cutie. the dress is adorable! it suits her well. nice job. What a beautiful dress! And such a fabulous model too! Great work! She is soooo cute. Love the dress too! That is so cute! And the model??? What a gorgeous little girl! Thanks for sharing at For the Kids Fridays! I'm your newest follower from Social Parade and would love a follow back - thanks.